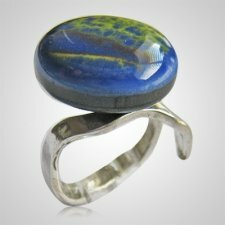 The Fiesta Memorial Ashes Ring is made from dyed glass. The stunning bead is mounted on a beautifully contemporary sterling silver base. The base is adjustable and will fit most ring sizes. The ashes are hidden in the bead for an elegantly discreet memorial. We will mail you a “Glass Keepsake Kit” for you to place the remains in and mail them back to us. "Although I couldn't find a WHITE Pomeranian figurine for my beloved boy, "People"... (We named him People because he was all the people we needed) the American Eskimo was a perfect match down to the smile he always had. The personalization plaque was nicer than I expected. We now have our boy memorialized in the most cherished and dignified resting place. Thank you to all involved in creating this urn. "